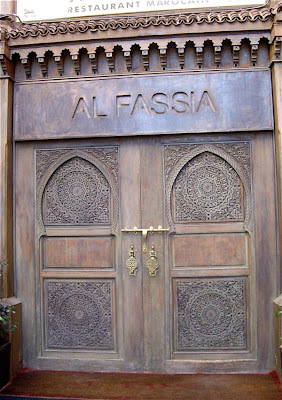 Al Fassia is a classic Moroccan restaurant run by a women's collective located in Marrakech's Gueliz district. It was recommended by our travel guide as a great place to dine. It is definitely a place to try if you want a traditional meal in pleasant interior. Al Fassia is located in a city street in Gueliz. We decided to walk, and it took us 20-25 minute to get there from Djemaa el Fna, the city's main square. Gueliz is the new part of Marrakech. It looks like most Mediterranean cities and it bears a clear mark of being a part of French cultural sphere. Behind a massive metal door, you find All Fassia restaurant. 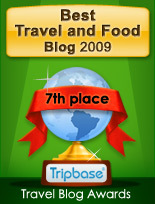 Al Fassia Gueliz is rated as number 7 of 227 restaurants found in the city at tripadvisor. Al Fassia has several dining areas, and we were seated in a beige and coffee-coloured room with a glass wall facing a small courtyard filled with tropical plants. We were comfortably seated by an elegantly dressed table where knives and forks, plates and glasses and napkins were elegantly placed on a white table cloth. 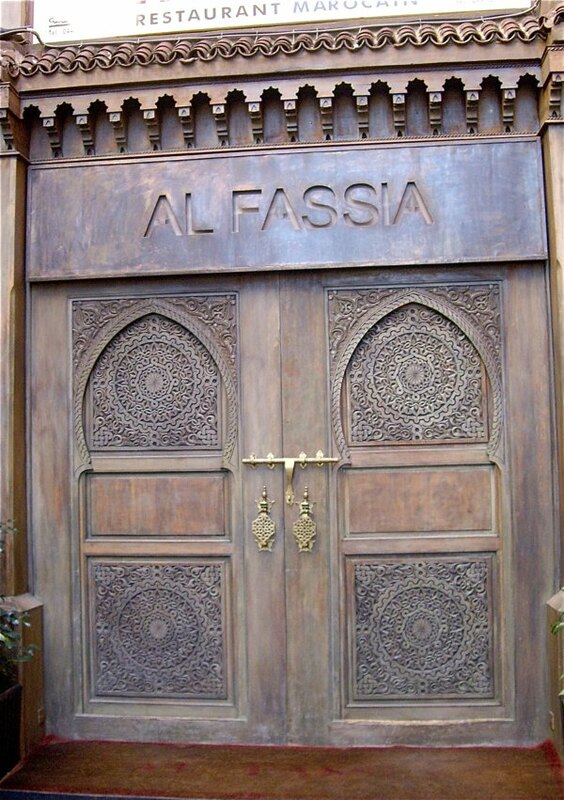 Al Fassia is owned by women and you are served exclusively by women. You feel exceptionally welcome, and the service is elegant, efficient and low key. It is a place to relax and enjoy your meal. And the service was swift as well as discreet. We did not have to wait long to get our food, and efficiency did not affect the quality of the food. 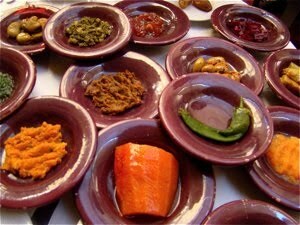 The first food to be served proved that we were in the Mediterranean region, as 12 small dishes with different small, meze style dishes as appetizers before our meal. We were surprised by the range of balancing flavours and textures. Salt, sweet, hot, and even floral aromas were blended in the primarily vegetarian berries, roots, either whole, sliced or mashed. 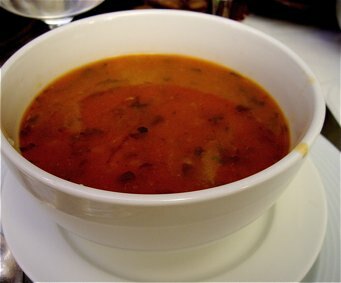 The appetizeres were followed by a bowl of the classic harira soup made with the ras el hanout - a blend of spices and served as customary with dates. The Harira soup was one out of three that I was served during my time in Marrakech, and definitely the best. Thick, and the subtle sweetness of the dates matched the exotic heat in the soup perfectly. The third dish was a small serving of two lamb skewer of lamb on rice. 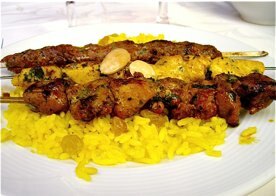 The succulent tender pieces of meat was gently seasoned with local spices and served on brightly yellow coloured rice. Toasted slices of almonds were served on side for a little extra crunch. The size of the portion was well adjusted to the rest of the meal. We chose half bottle of local wine to the main dish. It was partly based on syrah grapes, and the rich full bodied wine matched the food well. Al Fassia served one of the best meals of our trip to Marrakech. Expensive compared to many other restaurants in the city, it was well worth the investment. 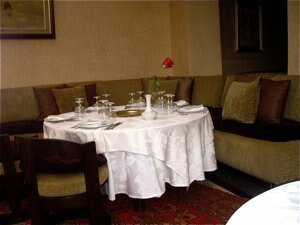 It offered low key and excellent service in a contemporary still traditional interior. 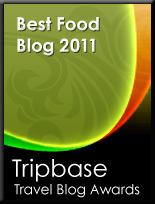 Enjoy Food & Travel recommends a meal at Al Fassia Restaurant, if you happen to visit the city.